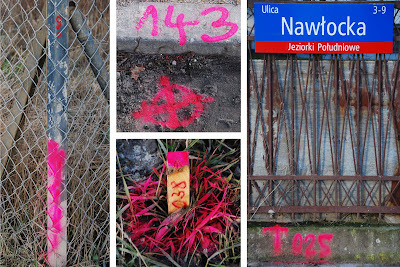 W-wa Jeziorki: A pavement for ul. Karczunkowska? Walking to the station this morning, I observed strange signs made in fluourescent pink paint and fat-nibbed marker pen made along the length of ul. Karczunkowska (above). I surmise that this means surveyors are marking out the road for widening or for putting down pavement. Having ruined a suit last November as I evaded a truck heading for me while walking along the roadway en route to the station, I can say this is an absolute priority. It may tempt more people from Jeziorki to walk up the road and catch a train. One less reason not to.